Buffalo Bayou Park stretches over 2.3 miles and offers Houston residents access to one of the region’s last unchannelized urban waterways. With more than 15 miles of pedestrian and bike paths, including four pedestrian bridges, Houstonians can explore the restored ecology of the bayou. The park exemplifies a synthesis of public open space and green infrastructure. In late August, Hurricane Harvey unleashed more than 1 trillion gallons of water over the Houston region, exceeding the city’s average annual rainfall within just a three-day period. Through SWA’s resilient design the park conveyed stormwater, protected adjacent real estate, and sustained minimal damage to primary park amenities. 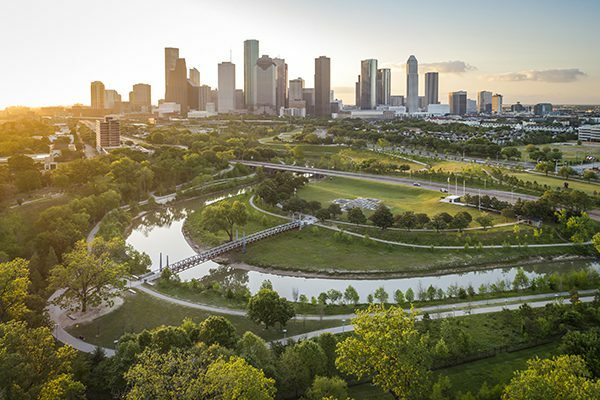 Buffalo Bayou Park serves as a tested model for resilient park design throughout the country. Read “The Proven Value of Resilient Design,” in Architect magazine, here. Please see ULI’s official announcement of thirteen 2017-2018 Awards for Global Excellence here.